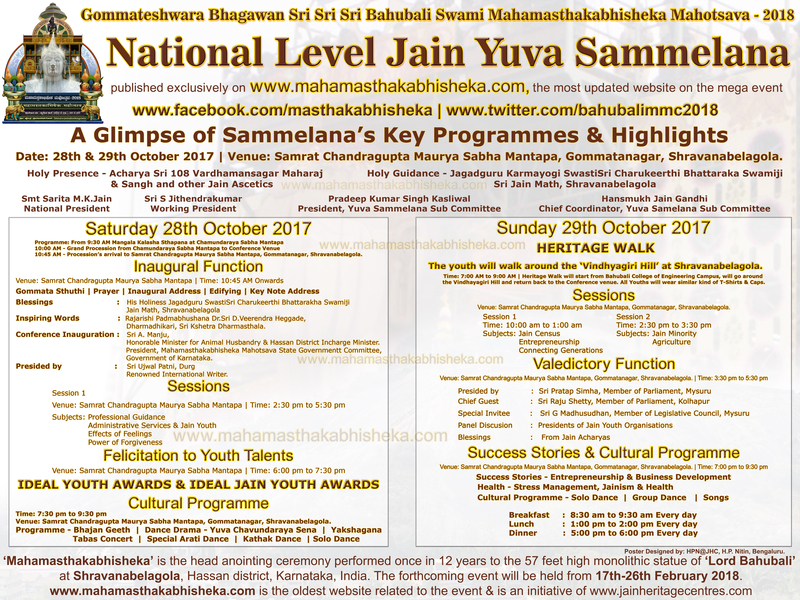 Shravanabelagola, October 22, 2017: A two days National Youth Conference – Rashtriya Yuva Sammelan will be held at Sri Kshetra Shravanabelagola on 28th & 29th ) October 2017 on the occasion of Gommateshwara Bhagawan Sri Sri Sri Bahubali Swami Mahamastakabhisheka Mahotsava – 2018. 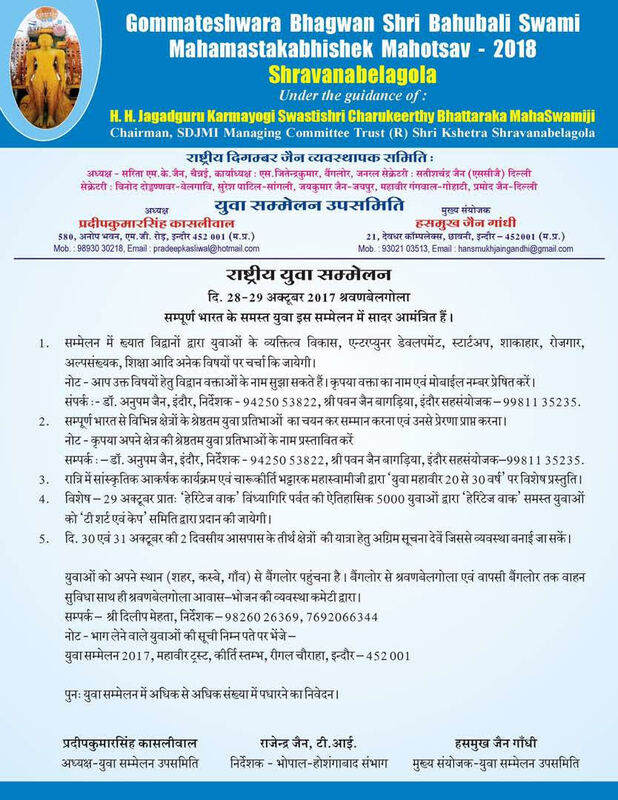 Shravanabelagola, September 1, 2017: A two days National Youth Conference – Rashtriya Yuva Sammelan will be held at Sri Kshetra Shravanabelagola on 28th & 29th ) October 2017 on the occasion of Gommateshwara Bhagawan Sri Sri Sri Bahubali Swami Mahamastakabhisheka Mahotsava – 2018. Click here to download English Poster High-Resolution version. Click here to download Hindi Poster. Conference Highlights – Expert Speak, Youth Felicitation, Cultural Programmes, Heritage Walk. Online registration Link – goo.gl/fnGMn1. Experts Speak – Experts will be speaking on various subjects such as Personality Development, Entrepreneur Development, Start Up, Vegetarianism, Employment and Minority Status. Every Session will be followed by discussion. Note – Please suggest speakers or subject matter experts for the conference along with their mobile nos. Felicitation – The best youth talents across India will be recognized & felicitated during the conference. Note – Please suggest the youth talents from different fields for the felicitation. Contacts – Dr. Anupam Jain, Indore, Director – 9425053822, Sri Pavan Jain Bagadia, Coordinator – 9981135235. Cultural Programmes – On the night of 28th October attractive cultural programmes will be organized and His Holiness SwastiSri Charukeerthi Bhattarakha Swamiji will give a Special Presentation on “Yuva Mahavir 20 to 30 Years”. Special Attraction – “Heritage Walk” will be conducted where in 5000 plus youth will ascend the “Vindhyagiri Hillock”. “T-Shirts and Caps” will be provided for Youths by the organisers. Reaching Shravanabelagola – All Youths are advised to reach Bengaluru from their respective places. The committee will arrange for commutation between Bengaluru – Shravanabelagola – Bengaluru along with Boarding and Lodging facilities. Contact – Rakesh Vinayaka – 9425060655. Note – Youth intending to attend the event can send their details to – Yuva Sammelan 2017, Mahavir Trust, Kirthistambh, Regal Circle, Indore – 452 001. All Youths are requested to participate in large numbers in the Conference.